Lean Six Sigma is a wonderful tool that can help any organization in the successful execution of its strategies. It is primarily a management science methodology that focuses on determining critical drivers of success, removing defects, and eliminating waste or activities that are non-value added. The technique uses a framework that takes you through a set of phases in an orderly manner. These phases that guide project activities are: Define, Measure, Analyze, Improve, and Control (DMAIC). You can gain benefits from the tools and overall idea even if you are not very familiar with Lean Six Sigma or you are not equipped with a comprehensive system. So, how can you define a Lean Six Sigma strategy within your organization? Our competitor businesses are taking away our market by 12 percent every 3 months. We are experiencing great quality losses, and now these losses account for 45% of our client insatisfaction. If you do not have a such collection initiatives, then there are high chances that you lose the motivation to execute an improvement initiative continuously. Organization leadership must be aware of those problems so that they can understand ways in which Lean Six Sigma will solve the given issues. Once you have a problem for lean six sigma deployment, the next step is to define the objectives that you wish to achieve through Lean Six Sigma i.e. the LSS objectives. This needs to be done with the help of the LSS leader who understands exactly what is required for the business. It is important that you lay down these objectives as quantitative measures so that you can measure your performance from time to time. These expected gains could be in terms of efficiency, return on investment (ROI), quality of service, and even reduced costs. For instance, through the use of Lean Six Sigma, you could be looking to increase the efficiency of business processes by 20%, or improve the quality of service provided by 70%. These are examples of what kind of objectives should your business look to achieve through their Lean Six Sigma strategy. Break down the long-term objectives that you have defined previously into smaller objectives so that they can be achieved through a single lean six sigma project. Through this process, estimate the number of DMAIC projects that you will require for achieving each business objective. Now that you know how many projects need to be completed, estimate the amount of time and resources (particularly the number of belts) that you will need. Define a five-year long roadmap that outlines the timeline and resource allocation for each of the DMAIC projects that you need to complete for reaching the long-term objectives. By the end of this step, you should have a project deployment roadmap with quantitative measures of the number of total DMAIC projects, the number of belts to be deployed, and the time that will be required. The Lean Six Sigma Steering Committee consists of the LSS Leader, the Head of Divisions of a business, and the LSS Program Manager. Once you have a deployment roadmap to work with, you need to now train the steering committee, particularly the Head of Divisions about Lean Six Sigma. For training the members of the steering committee, arrange a 1-day awareness training program in which all the basics of Lean Six Sigma, including the role of the Head of Divisions, are explained. Provide the necessary information about the deployment roadmap such as the required resources to the members of the steering committee so that they are aware of what is expected from them. Before you can begin working on the DMAIC projects themselves, you need to first assess the applicability and effectiveness of the proposed problem-solving initiative. This means that you need to determine whether the suggested plan is actually going to show improvements in the business processes or not. What this does is that it ensures that you are not wasting time and resources on a plan that will not fulfil your desired resources. For this purpose, you need to identify the pilot projects and areas which can help you determine the relevance of a Lean Six Sigma initiative. With the help of the Head of Divisions, run a project selection workshop with the goal to identify the first pilot projects for your Lean Six Sigma strategy. Selecting and training people for your Lean Six Sigma project is a key ingredient for success during the launch phase of your Lean Six Sigma initiative. To successfully implement a Lean Six Sigma project, you need to select your best performers – the top talent – that are capable of learning and implementing new methodologies and you need to train them adequately for forming your Lean Six Sigma team. A Lean Six Sigma Black Belt is an individual that understands the Lean Six Sigma principles and philosophies such as the tools and supporting systems. A Black Belt is responsible for leading the implementation of a DMAIC project. Each Black Belt works full-time on the projects and depending on the skills and ability of the individual, they can handle up to 2-3 projects simultaneously. The next step that you need to conduct is to select the right people in your company for Black Belt training. 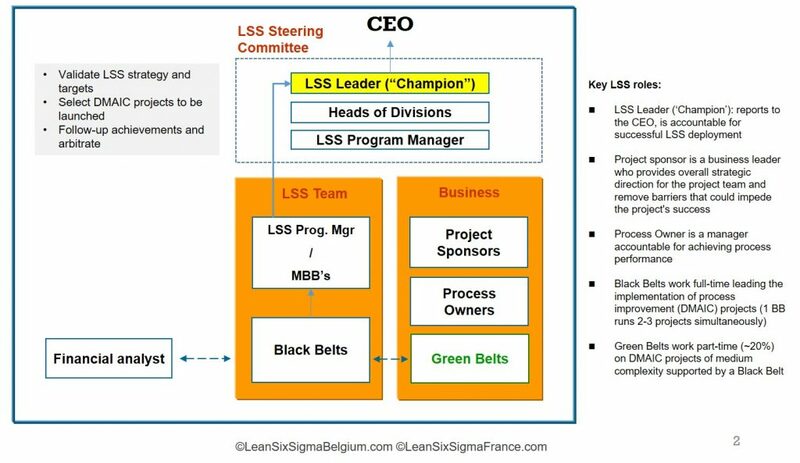 A program that is led by a Master Black Belt (MBB) should be initiated which will be responsible for selecting and training the Belts for your Lean Six Sigma strategy. Now, how many Black Belts should you train? Typically, the number of Black Belts that a company of 10,000 people should have in the first year of Lean Six Sigma deployment is 8 Black Belts with this figure steadily growing to 50 Black Belts in five years. In average 1 % of the organisation should be involved in operational excellence projects. However, this is not a specified rule and the number of Black Belts that you train should correspond to the number of projects that you have planned in your roadmap. A Process Owner for a business is the manager the is responsible for achieving the desired performance for a particular process such as invoicing. In a previous step, you identified the pilot areas for the Lean Six Sigma deployment roadmap. Now, you need to choose the processes that are involved with these pilot areas and train the corresponding Process Owners for the Lean Six Sigma strategy. Keep in mind that the training process should teach each Process Owner how to achieve maximum efficiency for their process by eliminating waste and reducing downtime. With the training of the LSS steering committee and LSS team now complete, you can initiate the implementation of the first DMAIC project. Start off by conducting a meeting with the Project Sponsor, Black Belt, Process Owner, and other LSS team members for the project under the supervision of a Master Black Belt (MBB). In the meeting, discuss the objectives and change that are to be achieved by the project and the approach that will be taken for implementing the project. Assign the relevant responsibilities to each team member through discussions with the MBB to launch the project. Once your first DMAIC project is successful, the next step is to deliver a report to the Head of Divisions and the LSS Leader so that they can assess the outcome. After this is done, certify the Black Belt who was responsible for the project as a Lean Six Sigma Black Belt and acknowledge that they have a successfully completed DMAIC project under their belt. Keep increasing this tally of completed projects for a Black Belt after they deliver a DMAIC project. Finally, after the delivery and certification of a project, launch the next DMAIC project(s) similar to how you launched your DMAIC project in the previous step. This will ensure that you are on track with your LSS deployment roadmap for the first year. The last step that you need to take is to conduct training sessions for expanding your Lean Six Sigma team even further. Firstly, you need to train Green Belts – individuals that work part-time on DMAIC projects of medium complexity and play a supporting role to a Black Belt. Secondly, you need to further train your Black Belts so that they become Master Black Belts – individuals that are responsible for the strategic deployment of the Lean Six Sigma in an organization. It is important to understand here that unlike a Black Belt, a Master Black Belt is not responsible for handling DMAIC projects but instead for supervising these projects and training Black Belts and Green Belts. After the training of these Green Belts and Master Black Belts is complete, your organization is ready for moving on towards the next stage of its Lean Six Sigma deployment roadmap. Ideally, a company of 10,000 people should be aiming to have 6 Master Black Belts, 50 Black Belts, 200 Green Belts, and a lot of completed DMAIC projects by the end of the first five-years of their Lean Six Sigma strategy deployment. Lean Six Sigma is a tool that can help an organization determine the drivers of success, remove defects from their strategy, and eliminate activities that are non-value added. The Lean Six Sigma deployment roadmap is a step-by-step process for defining a lean strategy in your organization – it is generally a five-year plan that has expected outcomes such as the number of DMAIC projects completed, number of Black Belts trained, improvement in Customer Service levels planned out for each year. 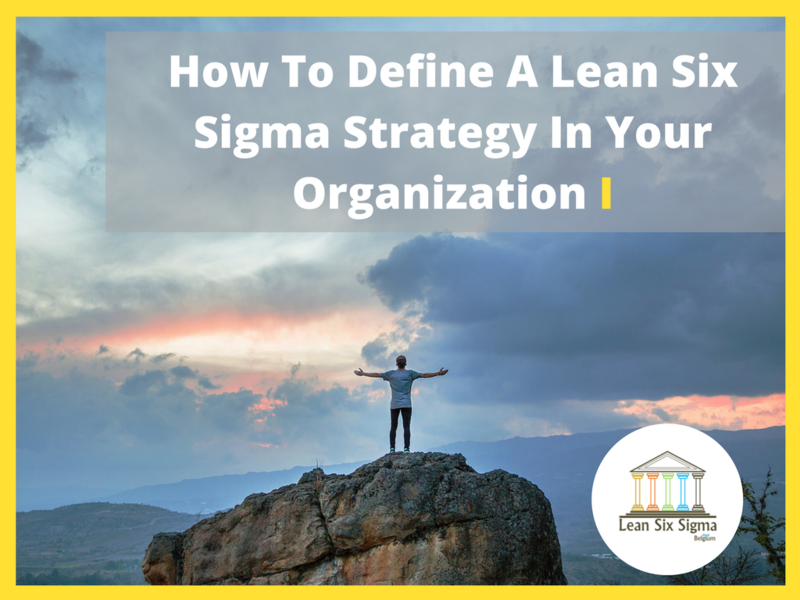 For defining a Lean Six Sigma strategy in your organization, you need to create a platform for deployment; define your objectives; estimate the resources required; train your Steering Committee, Process Owner, Green Belts, Black Belts, and Master Black Belts; identify pilot projects and areas; and deliver and certify completed projects.